The most exciting advancement in superhero and cartoon character collectibles since the 80s has been the introduction of highly detailed statues. Fans have been able to turn their collection shelves into fine art museums with the introduction of modern techniques in rendering lifelike statues of their favourite heroes and villains. 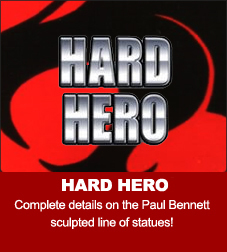 In 2009 for the first time in ThunderCats history, a statue company called Hard Hero picked up the license to bring ThunderCats to this new medium. Hot on their heels, Pop Culture Shock and Icon Heroes each snagged a license to create large format and smaller stactions respectively. More recently, Kinetiquettes announced they would be producing detailed statues, those will be added soon!